I have made a new project in AS6 and copied a number of 'old' files to the project. What I see is that when I write new functions these are collapsible. But the existing functions are not. How can I import files (run some sort of check tool on them) such that they all have the ability to collapse the function contents? as a side question I have seen a thread about the way studio 4 reports the used flas/ram & eeprom space. and how to also have this same method of displaying in AS6 but I cannot find back that thread. Where is this thread located? to be a bit clearer on what I'm looking for. and the Hide selection I get the same result. ofcoarse I can do that for every file and avery function, but I would epect this to automatically be done when I open a file in AS. I have also looked in the "Tools -> Option"
I had expected also a "Miscellaneous" section under "All Languages"
Are you having some functions that are not collapsible at all (i.e. lacking the plus-sign in the left margin)? Or are you looking for having all the contents of a file collapsed when opening it? 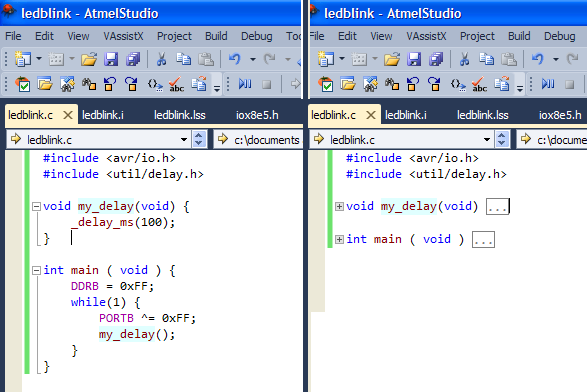 Also note: I've encountered at least one bug in the outlining in Atmel Studio 6. This seems to be an effect of the language module for studio (not the compiler, but the thing that parses the code to do highlighting, "go to def" etc) gets confused for some code. I have yet to investigate this more to get a solid enough bug report to file with Atmel. It seems to involve nested if-statements and comments, and the net effect is that there is a part of the function that is not foldable (the C language module thinks it ends before it actually does). I'm not having 'some' functions that are not collapsible I have entire files that are not collapsible. I have been working on one file in that project that was collapsible, but that was only at the precompiler level. ( I think). It has an #ifdef statement that lets me choose for the uart to be interrupt driven or to be bitbang. There I can collapse on that level, but not on the function level below that. I also have a file with main and 2 other functions and non of them are collapsible. Are you saying you cannot make the thing on the left look like the thing on the right? the + and - are missing in front of the function headers. I have seen the IDE confused by nested #ifdefs so #ifdefs may be the reason for your problems. Try temporarily commenting out the #ifdefs to find out if that's the case. As I said above, there are cases (not involving #IFDEFs as far as I can tell, where the folding does not work. I have an ambition to file a bug report re this, but not without having enough info to make it a decent report (i.e. the "minimal repeatable case" that I always nag about when people post 1K lines of code and asks "Why is my LED not blinking?"). I should have left this to later, but it actually took just a few minutes to create a few screen dumps in a minimal demonstrator. Due to CSDL (complex screen-dump logistics) it might take a few minutes more before I can attach them to a post here. What I was referring to is not a folding problem, it's something else. But in that case, the IDE is definitely confused by #ifdefs. It turns out they don't even have to be nested. It's not entirely off topic, as the IDE gets confused by the source code in this case too, so I'll post a short example to illustrate. Click between the two Bs in main(). The strip just above the text editor now states "enum BB = 1". That is obviously not correct. But I'm hardly using #ifdefs and for sure not nested as I would definitely confuse myself more then the IDE doing so. in my 'main.c' there are no #ifdefs so there I would not expect it to fail. Nice pics... You are going to post a bug also I hope? In Johan's case, the IDE is confused by the comment following the opening brace. Put a linefeed between the opening brace and the comment and the problem is gone. I'll poke at it and see if I can spot more specifically what makes this happen, but I have a strong feeling the opening gull-wing followed by a comment on the same line is involved. It has little or nothing to do with the while-clause. When I have something substantial I'll file a bug report. I believe it is somehow related to the way the if-clause is written. Like I said above, it's the opening brace followed by a comment on the same line that is causing this in the case you posted. it does not have a single collapsible part in the project I have. Just checked all of my project C files and there are some that do have the collapsing possibility. Also a number off collapses have the opening brace + comment issue as described above. when I indeed add a crlf behind the opening brace the collapse indication goes to the right point. the collapse originally goes to the closing bracket after "truncte the string...."
Add a newline between any brace and the comment after it, and it will start working. This applies to closing braces as well as opening braces. Side notes now: I must say that the habit of having a comment after an opening gull-wing looks ugly to me. E.g. the comment could well get detached from the code it comments on if there is new code lines inserted just after the line with the gull-wing. 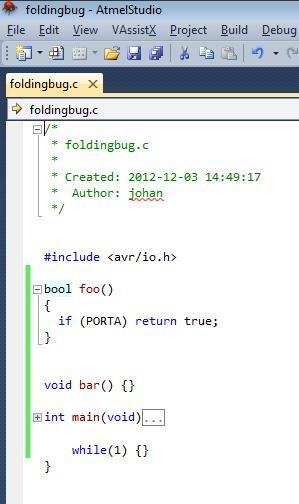 I must say that I have not seen this very often, but there is code out tere that does it. but not a combination with half of one. That is really to bad. I would expect that the program that interprets the code would see the opening/closing gull wing and then act accordingly. to bad it gets confused by this. In addition I will try to resist using //***** for header comment blocks, but what are then generally good alternatives? or are there other generally accepted methods. for(l_Cnt=0;l_Cnt <- perhaps needs to be special char like ? but that is collapsing to text "//Check for new event"
I really wonder what I do wrong here for the collapsing to select this entire function rather then the case part. Slam that into a newly created project. Then try to collapse each of the case's in order - you'll see what I mean. There are obviously many ways to confuse the collapser, with or without comments. I was already starting to thing I was doing something simple and stupid wrong. meslomp, this does not make sense ?? the duble curly brackets prevents collapsing. Does anyone know if it's possible to setup the AS6 to collapse all on startup ? If you can´t fix it... try harder. 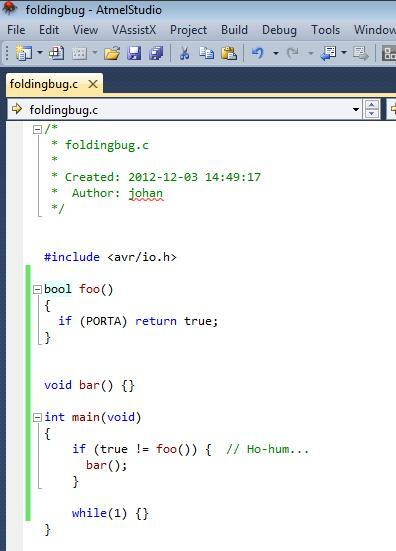 Not even Visual Studio does this IIRC. It once had that option but it was removed, methinks. For VS2008 (or was it 2010) I located a 3rd party plugin that did the trick. Best you can do is probably to memorize the keyboard shortcut for it.